"Best deal in town," says Frank Napolitano. "Great place to dine with family and friends. What a feast!" Luigi's serves lunch and dinner six days a week (closed Tuesdays). Menu includes pizza, pasta, and Luigi's famous Sicilian rice balls and garlic bread. Takeout and free delivery. A great meal -- and a wonderful family environment. 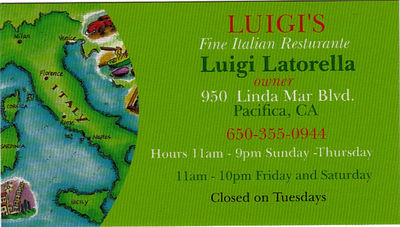 Best Italian food in Pacifica -- and we've tried em all! Luigi's has the BEST pizza EVER! Try the Rice Ball. It's a centuries-old Sicilian specialty: juicy ground-beef meatball encased in white rice, then battered and deep-fried, and topped with marinara sauce and parmesan cheese. IT DOESN"T GET ANY BETTER THAN THAT, MY FRIENDS!!!!!!!!!!!!!!!! Congratulations to Luigi The Pizza & Pasta Man for getting a free half-page ad in Pennysaver. Clip the coupon on the Free Page for free garlic bread, one of Luigi's hits, along with the eggplant parmesan. We eat there all the time, He is a great guy and the food is wonderful. He really tries hard to satisfy all your needs. Next party, call Luigi`s.